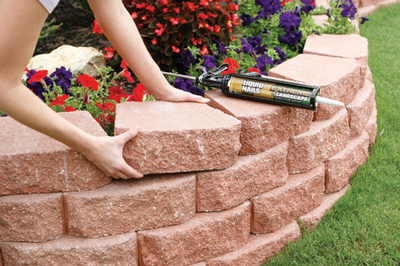 Liquid Nails Extreme Landscape Block, Stone and Timber Adhesive is recommended for use on garden and retaining walls, capstones, planters, walkways and steps, according to PPG. The product has been developed to perform in extreme conditions, bonding in temperatures from 22 to 120 degrees F and to wet and frozen materials, the Pittsburgh, PA-based company says. The product is recommended for garden retaining walls and walkways. The manufacturer says the formula provides long-lasting adhesion in a wide range of indoor and outdoor applications and has been certified by UL Environment to the Greenguard Gold standard as a low-emitting material. The adhesive comes in a plastic tube for outdoor storage. Liquid Nails is a brand of PPG Architectural Coatings, a business unit of PPG Industries Inc.